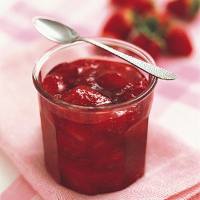 Preserve the flavour of luscious English summer strawberries with this simple recipe for jam. Preheat the oven to 170°C, gas mark 3. Wash 4-5 jars in hot soapy water. Rinse and dry them then place in the oven for 10 minutes to sterilise. Turn the oven off, but leave the jars in the oven to keep warm. Place 2-3 saucers in the freezer to chill. Place the strawberries and sugar in a large wide pan with the lemon juice and heat gently, stirring occasionally, until the sugar has dissolved. Stir in the butter and bring to the boil. Boil rapidly for about 5-6 minutes until setting point is reached. Test this by placing a teaspoon of jam on a cold saucer. After a couple of minutes push your fingers through the jam. If the jam wrinkles it is set, if not, return the pan to the heat and boil for a further 2 minutes, and test again. Continue until setting point is reached. Remove from the heat and skim off any scum from the surface using a slotted metal spoon. Leave to cool for 30 minutes. Stir the jam, then ladle into the jars. Cover with waxed discs and jam pot covers. When cool, wipe the jars with a warm cloth. Label and date, then store for up to six months in a cool dry place. Choose slightly under-ripe fruit if possible, as it contains more pectin which helps to set the jam. When washing strawberries, remove the stalks and hulls afterwards to prevent water entering the fruit, making it soggy. Use a jug to pour the jam into the jars more easily. Jam sugar is used as it produces a clearer jam, a better set and less scum than granulated sugar.